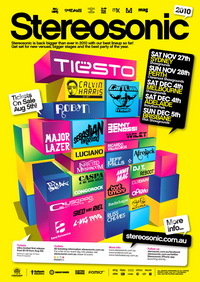 The first event of Summer returns..
2010 sees Stereosonic move to Sydney’s best facilitated venue. Only a 15 minute train ride direct from Central Station, the Showgrounds MAIN ARENA and surrounds has no sound issues, a later closing time, ample parking and easy public transport, it comes with state of the art facilities, plenty of green space and no stage capacity issues. We are excited with the biggest ever capacity for an electronic festival in Sydney. Who was to know we would outgrow Eagle Farm in its first year at the venue! Well, we did! Stereosonic is now moving back to the RNA Showgrounds with increased capacity and we will utilize a new main stage and multiple areas in this custom built event space. With such a massive lineup in Sydney and Melbourne, we have added a 2nd 10,000 capacity stage to cater for the sheer multitude of acts and people. In Melbourne we have opened up another 30% of the Showgrounds space now utilising the entire Melbourne Showgrounds. In staying true to our core ethos, Stereosonic will continue to aim to deliver the best lineups possible, at the best possible ticket price. We have raised the prices slightly this year to help improve our services to you on the day and to enable us to deliver the biggest acts in electronic music!